The bulk of this collection has been in the Archives since at least 1959. The 1944 report on Scrub Typhus was donated to the University Archives by its author, John J. Sayen, in August of 1959. In April of 2007, Gregory G. Prakas (the son of Technical Sergeant George G. Prakas, Sr.) donated the roster of officers and enlisted personnel included in an invitation to a Christmas party held while the unit was stationed in Assam. The collection has been organized in four series. The first series includes lists of personnel, both staff and enlisted, of the 20th General Hospital. The other three series include papers and records of three staff doctors: Robert A. Groff, Thomas E. Machella and John J. Sayen. In 1940 the United States Surgeon-General called upon the University of Pennsylvania to organize an overseas military hospital along the lines of the successful civilian Base Hospital No. 20 organized by the University in France during World War I. 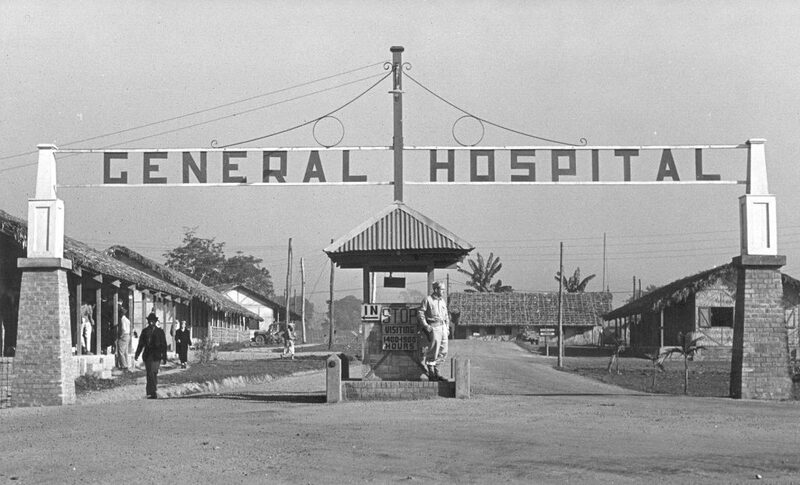 As a result, a Penn medical faculty committee organized the 20th General Hospital, a World War II medical facility which would operate in the Assam jungle region of northeast India on a scale and duration even greater than Penn’s earlier wartime medical achievement in France. The 20th General Hospital staff was assembled and trained long before its deployment overseas. Dr. Thomas Fitz-Hugh, Jr., Assistant Professor of Clinical Medicine, became Chief of Medical Service and Dr. Isidor S. Ravdin, Professor of Surgery, served as both Executive Officer and Chief of the Surgical Service (in 1945 he became Commanding Officer). Mary Cornelius and Vera F. Shaw headed up the Hospital Nursing Staff. As in World War I, most of the Hospital’s staff (59 medical, surgical, laboratory and dental specialists, 120 nurses and approximately 600 enlisted men) had ties with the University, particularly the hospital and medical school. The Hospital’s preliminary preparations–meetings, committee work, the commissioning and training of staff–took place in Philadelphia over a two-year period. The unit entered active service on May 15, 1942, with a large and enthusiastic send-off from the crowd at Philadelphia’s 30th Street Station. After training at Camp Claiborne, Louisiana, the unit left for India in early 1943, arriving on March 21 at Ledo, where a huge military installation was being created. Ledo was the spot in Assam chosen as the western terminus of the road being built into North Burma, at that time the only communication route between the Chinese and the Allies. Here in Ledo the 20th General Hospital took on the mission of providing medical care for the American, British and Chinese forces fighting the Japanese in Burma as well as for men constructing the road. In Assam the hospital and its patients, nurses, doctors, and enlisted men were housed in native structures (“bashas”) with dirt floors, sometimes covered with bamboo matting, leaky roofs of palm leaves, and no lights. In this area of heavy rainfall and few outlets for water, malaria and bacillary and amoebic dysentery were constant. Penn’s doctors had to deal with battle casualties in an environment that not only made medical treatment difficult, but actually added to the problems. The achievements of the Penn medical team were remarkable. There were high profile stories, such as Major Harold Scheie’s treatment of Lord Louis Montbatten after his eyeball was pierced during an inspection tour in North Burma. But such stories were only part of Penn’s outstanding war-time medical service. The Hospital ultimately occupied 289 buildings and 162 tents, and admitted 73,000 patients. The staff was able to implement modern practices including antibiotics, sound surgical principles and innovations such as air-conditioning. Despite dealing with battle casualties, scrub typhus, cerebral malaria and other challenges, the overall mortality rate was only 0.4 per cent–no worse than for civilian hospitals at that time. At the end of the War, the 20th General Hospital staff returned to a heroes’ welcome. Members of the staff maintained their war-time bonds through a number of reunions during the decades that followed. Many of the doctors on the staff resumed their teaching and practice of medicine at the University of Pennsylvania, leaders such as Ravdin and Scheie made important contributions in their fields in Philadelphia and nationally. Papers of three Penn doctors serving with the 20th General Hospital in Assam are included in this collection. Dr. Robert Armand Groff (1904-1975), A.B. 1925, M.D. 1928, had studied in Europe before becoming an assistant professor of neurosurgery at the University of Pennsylvania in 1937. After serving as a neurosurgeon in the 20th General Hospital during World War II, Groff returned to Penn, later serving as head of the Department of Neurosurgery from 1957 until 1968. Dr. John Joyce Sayen (1914-2003), M.D. 1939, did his internship and residency at the University of Pennsylvania Hospital, finishing his residency in 1942. In Assam he served as head of the typhus ward, and recorded what he learned in the secret report on Scrub Typhus, he submitted to the government on May 28, 1944. After the war Sayen practiced cardiology at HUP and served as the principal investigator on research studies on the treatment of heart disease. Dr. Thomas Every Machella (1910-1962), A.B. 1931, M.D. 1935, had been an intern and then chief resident at the University of Pennsylvania Hospital before becoming a specialist in clinical gastroenterology. By the time of the deployment of the 20th General Hospital, he had risen from Instructor to Associate Professor in Physiology, having published eleven papers, primarily dealing with vitamin studies. While serving as a captain and then a major in Assam, Machella built a small laboratory in one of his wards in order to study an epidemic of jaundice; his notes and writings resulting from this study are included in these papers along with lecture notes from the time he spent at the Tropical School of Medicine in Calcutta. His medical work in India resulted in thirteen published papers and in his award of a Bronze star. After the war he returned to teach and practice medicine at Penn. These records focus on the activities and medical research of the 20th General Hospital from the time of its deployment to Camp Claiborne in May of 1942 until the unit’s disbandment at the end of World War II. Dr. Robert A. Groff’s diaries and medical notes document activities of the unit at Fort Claiborne as well as the early months of deployment in India; Groff also describes the countryside and way of life he encountered in India and Burma. Dr. Thomas E. Machella’s scrapbook contains clippings and memorabilia for this same time period. Dr. Machella’s military records provide detailed official documentation of one doctor’s military service, both as a reservist and on active duty. Machella’s papers also include his patient data, experiments, medical reports and lecture notes, as well as his copy of the 20th General Hospital’s medical technique book (60 pages). Machella’s research focus was primarily on tropical medicine, particularly jaundice after yellow fever inoculations. Dr. Sayen’s report presents his research on the epidemiology of scrub typhus and its implications for the military.